1. Show 5(or more) words in order in a short time, about 5 seconds. 2. At this time, students CANNOT write the words on the answer sheet. 3. After 5 seconds, teacher says write! (On the screen, no words remain) Students recall the words and write down the words or words' meaning in order on the answer sheet. 4. Switch the answer sheet with other groups and check the answers. * It's really easy and simple activity, it will take 1-2 minutes for teacher to type in the words. 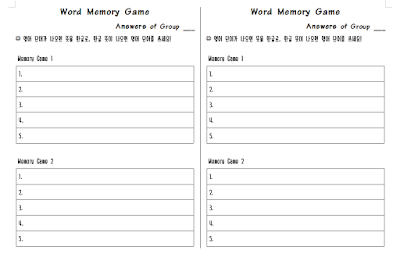 * For lower level students, it will be better to give English words and let them write Korean meaning. For higher level students, you can provide Korean and make them write in English. For mixed level, one set of Korean and another set of English will be okay. 1. 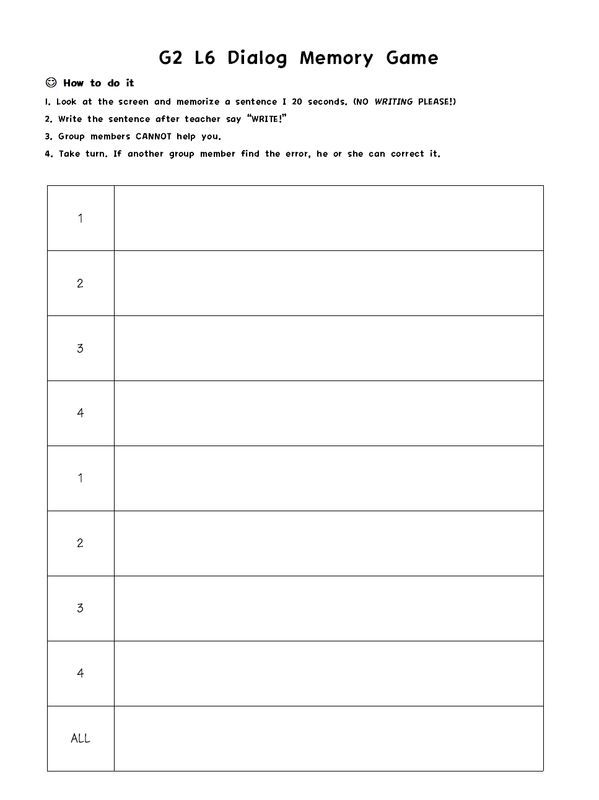 Make students groups of 4, assign each student number 1 to 4. 2. Teacher shows students a sentence on the screen. Each student has to memorize the sentence in a short time. 3. After 10-20 seconds, teacher says "write!" and student #1 should write it down without watching it. In this stage, group members CANNOT help student #1. 4. Students take their turns. 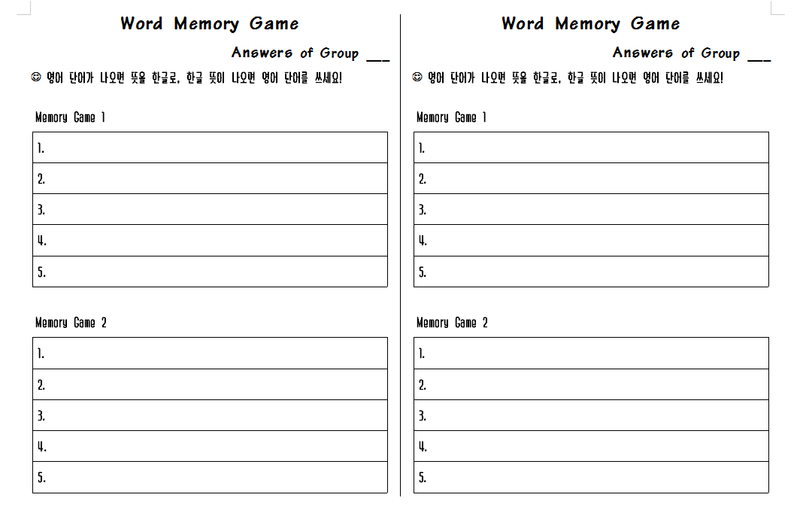 Student #2 has to memorize and write the next sentence, which is shown to students for another 10-20 seconds. 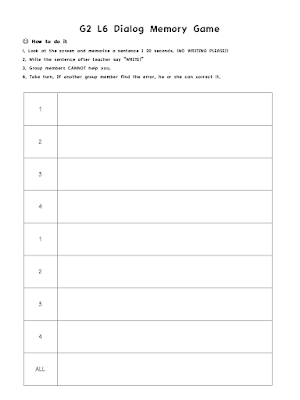 This time, student #2 CAN correct the sentence that student #1 wrote if it contains any mistakes. 5. Students take their turns once or twice (normally twice for Dialog in textbook). 6. Before checking, teacher play audio of the text and ask students to check by themselves. Students can discuss with group members in this stage. 7. Switch the answer sheet with other group and check the answers. * You can provide some Korean clues with students. * Students' awareness of punctuation can be promoted while checking the answers.